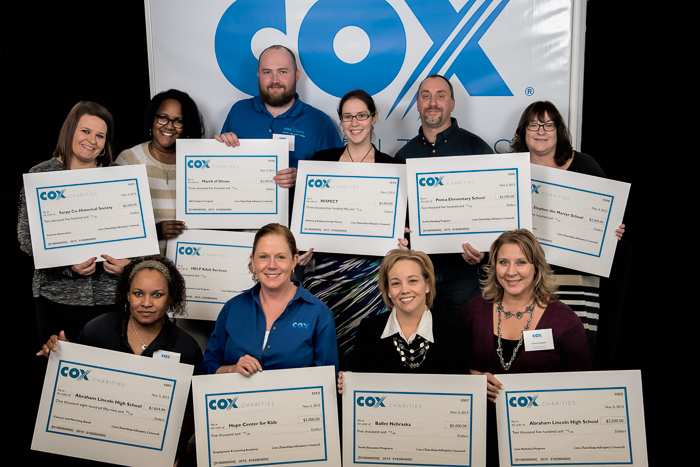 Members of the Cox Charities Advisory Council display grants awarded at the 2016 Cox Charities Awards Luncheon. Recently Lisa Caudle, of Cox Communications’ Community & Public Affairs, shared insights into Cox Communications’ corporate charitable giving and the impact that employees are making locally through Cox Charities. What is your organization’s philanthropic philosophy and how do you go about carrying it out? Cox Communications’ dedication to investing in the communities where our customers and employees live can be traced back more than one hundred years to our founder, James M. Cox. Giving back to the neighborhoods we call home is just who we are. The Cox Charities program is a great example of this commitment. Our Innovation in Education grants awarded to local schools and teachers are designed to foster creativity, stimulate young minds and inspire excitement for life-long learning in students across the metro area. Our Community Investment grants provide essential health and human services to those most in need in our community, broaden the world of youth through the cultural arts and nurture a sense of togetherness in our neighborhoods. Our Cox Cares employee relief program provides immediate short-term assistance to employees experiencing severe financial hardship due to unexpected and unavoidable emergencies (such as natural disasters, medical emergencies, funeral travel or military deployment). How do you involve employees at all levels of the organization in Cox Charities’ giving, from making personal investments to having a voice in decision-making? Cox Charities is amazingly simple, yet simply amazing, in the way it places our employees at the heart of the charitable giving process. Our employees embrace a spirit of giving and know that we make a greater impact when we work together. The foundation is employee-funded. Along with a modest corporate gift to the program each year, every dollar raised comes from our generous local employees through payroll deductions. Whether it is $1 per paycheck or $40 per paycheck, every contribution makes a difference in our community. It is also employee-directed, with an Advisory Council of 20 non-senior leader employees representing their coworkers and serving as the grant determination body. Additionally, we’re launching a new component of Cox Charities in 2017: The Employee Choice grant. All Cox Charities contributors will be invited to vote for one of five charitable organizations. The nonprofit receiving the most votes will receive a $5,000 Cox Charities grant. How has partnership with the Omaha Community Foundation assisted Cox Charities in executing your vision for your corporate giving? Our partners at the Omaha Community Foundation have been a critical part of Cox Charities’ success! Housing our funds at OCF gives our employees confidence that our funds are managed wisely. Matt Darling, OCF’s Vice President of Donor Services, provided invaluable guidance to our team as we launched the program in 2015, helping put a framework around the grant process. Matt Darling and Emily Nguyen, OCF’s Director of Research and Evaluation, have graciously attended each Advisory Council meeting to offer insight on reviewing budget information, share “best practices” from other grant-making organizations and relay key information from The Landscape to help our council better understand critical needs within our community. What insights or advice would you share with local businesses as they are defining their own corporate social responsibility programs? Though the CSR program will need to fit logically within the company’s overall culture, it must also truly reflect the cares, concerns, and interests of employees. Engaging employees in a meaningful way creates a shared sense of ownership and gives everyone a stake in the program’s lasting success. It is vitally important to gather feedback from inside and outside your company, and then don’t be afraid to use it! Employees offer a variety of perspectives that provide excellent clues into what is going well and what isn’t. Partners like OCF can provide outstanding objective feedback and prompt new ideas that can make a significant positive difference. Finally, don’t be afraid to set high goals. The saying, “Continue to shoot for the moon. Even if you miss, you’ll land amongst the stars!” always applies when you’re looking to make a difference in your community. The Landscape: A New Project!